Bella's first gift from Santa! As we all look back on 2009, we can truly see a wide array of events that have occurred to all of us, either individually, as a community, as a nation, or as the planet. As we consider each event, we tend to assign a value to the event i.e. it was "good" or "bad". The news outlets are chock full of articles about "the best" and "the worst... of 2009." I guess some of those valuations could be "objective," (i.e. the stock market went up or down, Bella was born, etc.) or "subjective" (i.e. Bella's condition is a blessing / curse). I am grateful that we can assign those valuations ourselves. I have seen so many miracles this year. I have seen trials and tribulations, too. May be different from you. out of all of this mess? Do we use to progress? more loss or more gain? Well, that just popped out. Sorry for the diversion. When it hits, just gotta flow with it. Man, I am so grateful I've learned to let God flow whenever God knocks. HAHAHA... wait a minute. Let me rephrase that. I am so grateful that sometimes I have the presence to listen WHEN God knocks. The dietician was thrilled with where Bella has come since getting her G-Tube. Bella is 2% above the ideal weight for her height at her age. Remember those 90 minute wrestling matches - I mean bottle feeds - and only 20-24 ounces a day? well, she's been getting 30-36 ounces a day since early October and it brought her from 50th percentile to 75th percentile in weight for her age. The catch is that she is 95th percentile in height, so she needs to have more weight on HER than on a smaller framed kid the same age to be proportional. Factor in the constant need for extra calories for wound healing and the fact that if we do the BMT, we want her as healthy as possible going in, the dietician told us WE ARE RIGHT ON TRACK!!! "The KEY to EB is nutrition, and the key to nutrition is the G-Tube"
Having to endure certain people's repeated questioning of the G-Tube use has frankly been tiring on us, so this validation was well needed and, as it turns out, well deserved. The other results didn't really surprise us, either. The one stat that looks lower than it probably is is cognitive. The SLT explained that because of Bella's deficiency in fine motor skills, the assessment for cognitive is skewed because what they observe to measure cognitive development relies on use of fine motor skills. We did learn that Bella has an overall weakness across her entire left side. We didn't realize this. Between the left leg and the placement of the G-Tube (which is placed to the left of midline in the abdomen), her left side has been injured and/or healing since day one (literally). The cool thing was the PT gave us very specific ideas for exercises to address the global deficits as well as the hemispheric deficits. When the Regional Center PT came out, she was really intimidated by Bella's condition and really didn't offer too much. The PT at CHOC was at the other end of the spectrum, where she was thinking about what Bella could do instead of what she couldn't do. Christmas was a blast, but perhaps the real holiday miracle was the following Sunday. We drove to my brother's in Phoenix for their baby's baptism. At the party afterward, we watched as his little girl, Liesel, and Bella played together while Paul and I held them. They were both born in May. Watch the video and cry, because this was a LOOOOOOOOONG time coming. My brother and I have had a tenuous relationship over the years (that was very diplomatically put), and for our families to come together like they did on Sunday, it was our Christmas Miracle. It was the type of thing that for many years, just seemed impossible. Cheers to you Paul and Heike, we love you, and Liesel is an angel we are honored to know and help nurture over the many years to come. 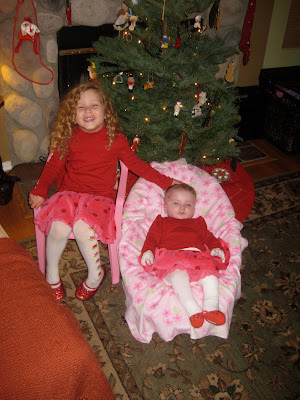 Christmas is really about celebrating new life, and with our two little girls sharing their first holiday together, the truest spirit of Christmas was fulfilled on that couch. How do YOU say it will go? Pray like it's all up to God, but work like it's all up to you. YOU are in the work business, GOD is in the results business. I keep thinking back to how easy we thought caring for Bella would be (when she was still in the womb), and how our real concern was how to handle Ali. Man, that seems like child's play compared to the hand we were dealt. Talk about a slice of humble pie. Through the sniffles, and stuffy nose, through the blisters and bloodied closthes, Bella continues to smile and drool the moment after anyone makes eye contact with her. It's as if she forgets about her Self in the presence of another, and instead focuses all of her consciousness "over there" with the other person, rather than on her Self. How easy it would be for her to be Self centered, given her condition. Yet, she abandons Self and spends her time out in the world, full of wonder, full of mystery. Her toughest times right now are while falling asleep. She goes through a strange ritual every time she falls asleep where it looks like she is wrestling sleep itself, hoping to keep if from "getting all over her." The way she swats at her head, bends, wiggles, and writhes in bed, you'd think sleep was like molasses, slowly poured over her, eventually encasing her in suspended animation. This might be viewed with baffled wonder or even a little humorous delight, except during the process, she manages to inflict some serious damage on her head, particularly her right ear. The ear, or area directly behind it, seems to constantly be in some stage of bleeding/bloody/blistering/breaking down. This morning, her entire right shoulder and upper arm were caked with dried blood. The all white "onesie" that she was wearing was soaked and stained like, well, something out of hollywood. It was rough on the eyes, to say the least. Further complicating the issue is her sweet little head cold, which prevents her from falling asleep with her favorite "binky" in her mouth. Her mouth is currently working double time handling breathing, so sucking on a binky is out. This is a blessing in disguise, though, because while the binky has been helpful, it has also been a crutch that ends up waking us throughout the night when it accidentally slips out. 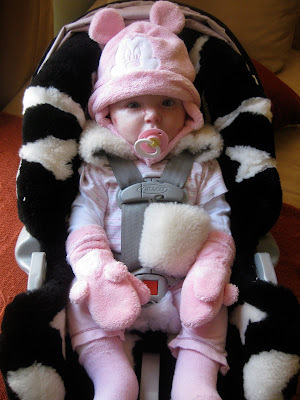 We are hoping that the cold will cure her of the binky dependence at bed time. In the meantime, we have to hold her limbs like a seizure victim until she fully succumbs to sleep. I am partial to doing this in her crib, because often times, when I hold her in my arms/ on my chest till she falls asleep, she awakens when I try to put her down in her crib, and then the whole process starts anew anyhow. She also likes to dig her right heel into her left knee, and her left toes under her right heel (not at the same time). we think this is because the knee and foot are healing and must itch. The rhythmic writhing that ensues, however, is causing the left knee to stay open despite the amount of bandaging. It's a pickle. Onto other happier news, we started introducing baby food to Bella. That's been going slowly, but we have had a couple of successful feeds. You should see Ang, Ali and I go crazy when she lets me put the spoon in her mouth... Bella must think we are off our rockers with how excited we get! Ali can barely contain herself from helping out. She is the best big sister ever! The one catch with Bella is that her hand bandages are going to be orange for a few weeks (at least while we feed her carrots and sweet potatoes). Last night, she grabbed the spoon and all of its orange baby food and just smiled as it soaked into the tubifast and rolled gauze. It was a funny moment. I realized that I forgot how messy baby food is for quite a while! Again, these are the fun problems to have. These are the ones we've been through, and know that everything will be okay in the end. We thank God for the fun problems. Bet you never put fun and problems together before, huh? Maybe, this Christmas, those 'problems' with Uncle this or in-law that might be fun after all. That is my Christmas wish for you. Merry Christmas, and thanks for still being here, almost 7 months later. I love spending 2 and a half hours with my baby, except when those 2 and a half hours are from 2-4:30 in the morning. Such was the start to the week. Riding the caffeine wave long and hard today. Bella, Ali, mommy, and daddy rode "Small World" ride at Disneyland last night! It was Bella's first ride! Her eyes were HUGE! It was really cute. We had a really good time last night. Ali has been really good with her manners of late and was rewarded with a long overdo trip to D-Land. Regional Center brought a Physical Therapist out on Thursday to do an eval on Bella to see if she is at-risk and eligible for services. Turns out she is. I put it in the good column, because now she will get weekly PT to help get her the physical development she needs and is avoiding due to her leg and G-Tube button. Despite it all, Bella continues to smile, laugh, and be mostly joyful (especially when medicated). Bella's foot. 'nuff said. The knee isn't much better. They go through cycles. We had quite a run where the foot was good, and it was just the knee giving us trouble. Now it's both. By the end of last week, the skin had sloughed off the foot completely and it looked pretty much the way it did the day she was born. That was frustrating. The skin just won't "stick" on the foot and knee - where it was missing at birth. Bella is going through a period where our normal late night soothing techniques are no longer working. Having to hold your infant gently down in her crib while she tires herself out from screaming so she doesn't further injure herself is NOT FUN. Holding her in our arms is just more dangerous when she struggles and harder to protect limbs and head during her screaming fits. In addition to being freakishly big, she is freakishly STRONG as well, and when she writhes in our arms, the possibility of her skin shearing against our body is very scary. We are booked for Minneapolis Jan 6-8 to consult with Dr. Wagner at U of M. We will know a lot more about 2010 after that trip. Now, we just need to convince the new insurance company it is in their best interest if we decide it's in Bella's. Another battle for another day. Well, it's Sunday and Bella's foot is going into a tough phase. We opened her bandages Tuesday and found the largest blister we've ever seen on her. (See video). Through it all, she never made a peep that anything was hurting her. So, we drained it and wrapped it and expected it to start to bother her right away. Well, it took a couple of days for the hood of the blister to start to break down, and now it's really bothering her. We're looking at probably 4 weeks of pain before it heals completely. We had been very lucky in that for quite some time we didn't need to medicate Bella for dressing changes. Time to reintroduce our friend Mr. Tylenol. We are grateful that she is not allergic to pain meds as our EB hero Sam is. I can't imagine what she's gone through. She is so strong. YOU are an inspiration, Sam! We installed a mobile over Bella's changing counter as well, and she LOVES it. We only wind it up when she gets upset, and you just wouldn't believe (or maybe by now you would) how fast the music returns a smile to her face. We also keep "You are My Sunshine" and "The Belly Button Song" (we like to call her Belly) on hand to sing to her whenever the smile turns south. Thanks to Grandma for getting her hooked on "you are my Sunshine!" She LOVES it! Also, the other day we lost 3 fingernail/toenails in one dressing change! That was kind of sad. Bella's nails are swiftly falling off her toes, and she's lost her right thumbnail, and the left pinky nail is on its way out. That's kind of a bummer. We didn't expect her to lose them so quickly! We weren't even sure if she would lose them or not. We were hoping that she would go through the BMT (Bone Marrow Transplant) soon enough to avoid any permanent loss of any part of her body. Oh well, losing fingernails is pale in comparison to losing Bella. Anyhow, Bella also LOVES the Rudolph the Red Nosed Reindeer doll we have. She wrestles with it and is fascinated by his glowing nose. When you squeeze Rudolph's left ear, his nose lights up and he says a couple of different samples. Bella's eyes get all wide and bright. It's sooo cute. Lastly, enjoy the first Holiday picture of the girls! The title of this post is taken from a cancer support group saying. It's their way of making light of yet another heavy situation. Just when we thought we were on top of the EB (for now), along comes the normal developmental milestones! Anyone sleeping out there through the night? It's allllllll goooooood. It's quite refreshing and a little bit cute and funny compared to the scary moments that have dominated the landscape these past 6 months. However, it does make for a crabbier-than-usual baby which creates more wounds on the face and head from temper tantrums. Combine that with the fact that the pacifier is the only way she will fall asleep, and if she's teething and mad, sucking on the binky has NOT been making her happy. We're thinking of keeping one in the fridge that's nice and cool when she really loses her cool. Hey EB parents, what successful strategies have you employed? Okay. Gotta run. Thanks for being there! Okay, so much for regular posts. Sorry about that! Bella had her 6 month checkup yesterday. Her stats, you ask? Our little bean is SPROUTING! We are happy and grateful she is thriving so well despite the constant blistering and healing she goes through. We are so thankful for her feeding tube. Before the tube, she was 50% percentile in weight, which isn't necessarily bad, but the PROCESS of keeping her at 50% was GRUELING borderlining on torture for all involved. Now, she drinks when she wants, and if she's crabby or asleep, she gets the tube and all is well. The Doc has her starting on rice for 2-3 weeks, then we're on to pureed veggies. We are a little dazed by the transition, because given how bad her mouth and throat were early on, we honestly never thought much about the chance of getting to spoon feed her orally. What a gift. Despite the ongoing challenges with blisters, Bella wakes up every day BEAMING from ear to ear. Her radiant beauty and happiness and JOY make it all worth dealing with. Daycare has actually been going well in November. In December we are going to scale both kids back to just one day a week, and I will take care of them the rest of the week. We are OUT OF ROOM in our condo and need to get into a house, and saving the HUGE monthly hit on daycare will almost equal our current mortgage payment! I will work from home developing products and services I can deliver from home instead of in front of a client/patient. More on that later. Ali grows cuter every day and loves her dance class she is in on Saturday mornings. She likes to call Bella her "Cuteheart!" Get it? (cutie + sweetheart!) Too cute. Mommy and daddy are wiped out from 6 months of sleep deprivation! We snuck away for our anniversary and spent the weekend at Disneyland without the kids. THANKS GRANDMA AND GRANDPA for watching the girls so we could be kids again! We'll try to be better about posting more often. Thank you for being in our lives. We have SO MUCH to be thankful for this Thanksgiving, and you are a large part of that list! Our new insurance provider covers all wound care supplies! WHEW. We have been extremely blessed in this area because both our current plan and new plan (2 different providers) cover wound care supplies 100%. This is NOT the case for MANY EB families. Many providers consider wound care supplies to be over-the-counter. Unbelievable. Second, we went to see Dr. Kling, Bella's surgeon, today for our 3 week post-op check-up. We were happy to see her; SHE ROCKS. It was great to check in with her as well because Bella got a blister under her button, and there has been some discharge coming out from around the button as well. We were concerned about it, but Dr. Kling took one look at it and said it was fine, and within normal limits. She said it takes about 6 weeks for everything to heal and set. We will be back in 6 weeks to learn how to remove and replace the button ourselves. Apparently, there are several types, so as she grows, the original may not be the best fit, but it was a good start. Bella had a stitch removed while we were there as well. She did NOT dig that one bit. Later today, grandma and grandpa came over to get trained on everything. GOD LOVE 'EM; they are watching the girls this weekend so mommy and daddy can sneak off to Disneyland for a long weekend to celebrate our 6 year anniversary! We've never been by ourselves, and we're staying in the Grand Californian Hotel right on the property, so we are really excited to get away and unplug...even though we'll have a cell phone on for stand by the whole time! We are blessed to only be 15 minutes from Disneyland, and we are DOUBLY blessed to have Ang's parents available for the whole weekend! They only live 25 minutes away! Alright..that's it for now. Thanks for all your continued love and support. I’ve said it before…what a difference a day makes. Every day in the hospital is a learning experience for everyone involved, IF they are willing to learn. Some people come to work and think they know everything they need to know and essentially ‘turn off’ their brains and run on autopilot. Some people come to the hospital thinking they have no say, or no knowledge of how to actually partner with the treatment team taking care of them or their loved ones. Point is, it’s rather easy to shut off the Creator Brain and just operate on Reactor Brain Mode. I’ve been in both situations myself, so I can speak from first hand experience! I’ve been that guy who just shows up and does his job while thinking about something completely different. I’ve been that guy who just follows along, not wanting to make waves. Thankfully, my beautiful daughter Bella has yet again reinforced my ability to shift from Reactor mode to Creator mode. For the past couple of weeks, Bella has really developed a hearty aversion to the special Haberman Feeder bottle we’ve been using. We have had to resort to getting her to fall asleep to sneak a bottle in to feed her. She absolutely REFUSES to drink a bottle while awake. It was quite the process: First, we swaddle her, then slip in the binky (clinical term for pacifier), then wait for her to fall asleep. Then, just as she slips into snooze-land, we slip out the bink and slide in the bottle in one smooth motion. Then, she drinks until she realizes what’s going on and gets pissed, or falls asleep totally and stops sucking altogether. It takes usually 30-60 minutes per bottle. However, if Bella happens to be wide awake (some nerve), she might not want to fall asleep, so we sit and fight and cradle and try and before you know it, 90 minutes has gone by, and the bottle has gone bad. So, it’s pretty regular for her not to get in 6 bottles a day this way. In an effort to keep her daily caloric intake up, we fortify those bottles with extra formula, and it seems to keep her weight up. 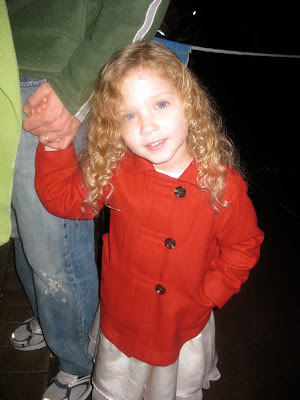 Last week, she landed in the 50th percentile for weight at her Dermatologist check-up. Her GI Doc is concerned she is developing strictures in her esophagus as a result of recurring blisters. We guessed she was getting blisters in her throat because she tolerates a binky but screams when she swallows. (I don’t know how much I’m repeating myself from my last post…long hours in the hospital and little sleep will do that to ya.) So, she got an esophagram on Wednesday. That’s also called a barium swallow. Bella got strapped onto a board, and they took X-rays of her while she drank a special cocktail that could be seen by the x-ray machine as it passed through her GI tract. Results came in today that they discovered a stricture at C5, the fifth cervical vertebrae. Dr. Grant, our GI Doc, will be in tomorrow to discuss what our options are. Meanwhile, there’s this little thing called … fever. Thursday, Ang noticed Bella’s temperature going up. It spiked Thursday at 103.2. She called the Doctor’s office, and they told her to give her Tylenol and come in the next day. Friday morning, Ang took Bella to the Doctor and they told her to take her to the ER. By 4:30, the Hospital said they needed to admit Bella. They wanted to get fluids into her and get her temperature under control. Oh brother, here we go again. Time to ward off well-meaning but untrained staff from harming Bella. I mean that in the nicest way possible. It’s just that with EB, many best-practices are actually contraindicated. Ang had to ward off the ER staff for 7 hours before getting up to the unit. In all fairness, the the staff was incredibly accommodating and open to Ang telling them what to do. So. Here we are. Back at CHOC. At least we’re not in the NICU again. We have a nice big room to ourselves with a pullout chair that Ang and I actually slept together on Friday night. We have a TV with VCR and a library of Disney movies in the play room just down the hall. We saw Beauty and the Beast (FINALLY), Fox and the Hound (not much of an upper after the first 20 minutes), Lady and the Tramp (awesome), Toy Story (good story trumps good animation, Dreamworks…learn a thing or two from Pixar about storytelling!) Hey, there’s not much to do while your standing guard 24 hours a day. Bella’s temp is back to normal and we are experimenting with a new bottle today. So far, she’s digging it, however, she can only tolerate 2 ounces at a time before wearing out, so slow and steady gets us back home. We are hoping to get outta here by end of the day tomorrow or Tuesday at the latest. The bigger picture is when are we going to put the feeding tube in. We’re thinking about just combining it into this trip since we’re already here, but we’ll all have a better picture after we meet with Dr. Grant tomorrow to discuss our options. We were hoping we could go through the clinical trial before having to get the G-Tube put in, but if it eases her suffering and ours along the way, that’s a good thing. First, who was the ER Doc that treated Bella? Our NICU Fellow Dr. Green. Boy, THAT saved a lot of explaining. Second, Ang and mom were a little late getting to the hospital this morning, and were a little worried I’d be mad since they had my morning Starbucks (I spent the night last night so Ang could go home and get some rest). As they were walking in to the hospital, Ang spotted our favorite nurse from the NICU, Tanya, walking through the lobby as well. They caught up a little and Tanya explained that she has received a scholarship from CHOC to do a review of literature to create a reference of best practices for patients with EB for CHOC! She has been a nurse less than 2 years, and has already had 3 EB babies, and is passionate about educating her peers so that future EB babies have it easier at CHOC. GO TANYA! Second, Bella’s I.V. in her head pulled out this morning so we had to put another one in. The second one lasted maybe an hour. The nurse who put it in was on the night shift, so by the time we could get the nurses to put in a third, she had been long gone. So, in walks our newest HERO at CHOC, Cynthia Smith. She has been a nurse for 36 years, and yet was as upbeat and fun as any new graduate we’ve met. She had experience with EB kids and had a clear plan about how to get this done right. We spent over 2 hours getting that puppy back in. It took two tries at 2 locations on her head, but at the end of the procedure, we got a custom-made, cap with chin-strap made to house her I.V. juuuuuuust right. By the way, Cynthia was in on her day off, and happened to answer a phone she was sitting next to. The caller was our nurse looking for any nurse who could start an I.V. in the scalp. She didn’t even know Cynthia. Cynthia just “happened to answer the phone,” as she explained. Third, as I moved into the Family Room on the 5th floor of the hospital to write this, I noticed a saying on the wall to the right of where I sat to write. Sound familiar? It’s the first three words of the chorus to Bella’s Song…just out of order…Live. Love. Laugh. Life is a game to play so that everyone wins. Remember, God’s in the details…in the little things. It doesn’t have to be clouds parting, choirs of angels singing moments to recognize God at work. It’s just the little paper cups of water along the marathon route that keep the runner going. Thanks God for the two cups of water today! P.S. I will be doing a better job posting at least weekly, maybe bi-weekly going forward. We’ve missed you guys! Well, up and down. This is the way with EB. Getting to meet Sean and his dad, Gregg, this week at my good friend Joe Polish's annual conference. I asked Gregg if I could interview him and his wife for The 5 Percent Collective and described my vision. While describing my vision, Sean says, "You could build a MOVEMENT around that." My vision? To empower parents with children with special needs with the qualities that those 5% of married couples who don't split up have and use to stay together and raise successful children. I want to create a monthly tele-seminar to interview those parents, but I want to create a retreat where families come and meet other families whose children have DIFFERENT special needs and diagnoses so they can see that while their diagnosis may be different, but the journey is NOT. Left leg is (knock on wood) looking great! I am in Phoenix while Bella has a fever that has spiked last night at 103.2 and today at 102. Mommy is bringing her to the doctor this morning while I sit in Phoenix. NO fun being so far away. Bella is getting blisters on her neck, back, torso, and places where she hasn't had them yet. Well, sorry it's been a while since posting! I've been at a loss for how to keep you all updated without you having to come to the blog to check, and I've been a little laid up since my accident. NO worries, though. Just wanted to reach out and touch base again. 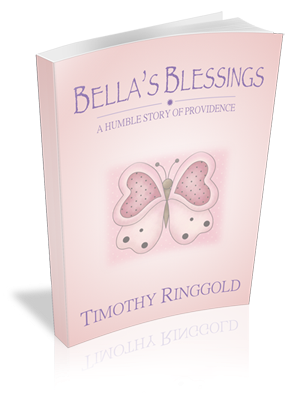 You see, today, I finished "Bella's Blessings: a Humble Story of Providence." Today's task was to finish importing all of YOUR comments. I was really inspired all over again by your generous love. After all, there were over 500 COMMENTS on that page in just 3 months. You guys are AWESOME! Well, Ang went back to work yesterday. She is happy to get back into a routine again. She was couped up in the condo all summer during the hottest months in SoCal, and since heat and humidity exacerbate Bella's condition, it was tough to get out. I'm back in the home for a month taking care of Bella. No worries, I had a blast with Ali for a month when Ang went back to work the first time, so I'm into it. Bella's feeding issue is as follows. She will NOT take a bottle awake. We have to give her a pacifier and let her fall "almost" asleep...then slip the pacifier out and slip the bottle in without waking her. However, make sure that bottom lip doesn't get sucked in...when Bella pulls that bottom lip in when she's sleeping, you can forget getting a bottle in there! We are fortifying her bottles with extra formula; still using chlorophyl and Alkaline water (pH 9.5), and still using the culturelle and Zantac 2x a day. Despite her bottle aversion, Bella seems to still be growing every week, so we're blessed. Regarding Minnesota, we are GO for consult in October, but STOP for anything else. Our insurance doesn't cover clinical trials. We are appealing, but it may be a mute point because Ang's company most likely is changing providers during open enrollment in October. U of M said that the new insurance provider usually works well with them, so keep your fingers crossed that the new plan covers clinical trials! The best part about reading old posts was that I came across my vision for Bella. "One day, Bella will look back and say, "yeah, when I was born I had this rare skin condition, but when they brought me home from the hospital, it went away." It dawned on me, that when we go through this trial, and Ali's cells start to completely heal Bella, we'll come home from U of M Hospital, and her condition will go away. When I made that bold statement, I never thought past CHOC, but GOD thinks a lot further ahead! Furthermore, she really will be young enough to where she'll have to read her own book to learn about this whole journey. Our hope and dream and vision and PRAYER is that one day, Bella will just have to take our word for it that life was anything other than typical. Good to talk to you again. Please comment and tell us you're still here! We love you, God bless you all. Pack your bags...anyone have a PARKA? Well, we're going to Minnesota, folks! We have a consult with Dr. John Wagner at the University of Minnesota Blood & Marrow Transplant Center on Wednesday, October 15 at 9am (if you're going to be in the twin cities that day - or the night before - let us know! Let's share a meal!). Things are moving along with the registration, paperwork, gathering of information. We are "in the funnel" as Tim at U of M, who is coordinating our care, put it. He expects that this whole process, including the bone marrow transfer and recovery, will happen within the year. 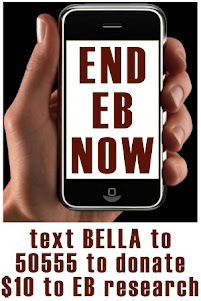 That means, by this time next year, Bella could be potentially free from the clutches of EB. She'll only be a year old. I don't remember anything (consciously) from that age, do you? You guys, let that sink in for a second. She could grow up having NO MEMORY of this. THAT is an inspiring vision to hold on to. There is a patient who is BMT +6 (6 days post transplant) right now and her mom is keeping us all updated through facebook. We are praying HARD for her daughter right now. I will ask if I can share her name with you all, but in the mean time...know that a girl is fighting for her life right now and needs EVERY ounce of energy, thought, intention, prayer sent her way TONIGHT. The good news is that there is an UNLIMITED amount of love and abundance available for all of us to channel wherever we choose! So SEND IT TO MINNESOTA RIGHT NOW, whatever time it is you are reading this, just take 10 SECONDS and pause, concentrate, focus on U of M BMT patient. Send light, love, laughter, healing, strength, peace, patience, persistence, FAITH, support, BELIEF, and trust...or any other you feel called to! Also. I am planting the seed now. Remember PUCK. It is a non-profit being formed to raise $$ for U of M's program. Right now, even with all the various EB non-profits out there, NOT ONE OF THEM is financially supporting Dr. Wagner's trial. I refuse to get into any of the politics of non-profits and competing research teams at competing universities. I will just say that Dr. Wagner's program is on the verge of a massive breakthrough for EB and no one within the community is stepping up to help. Weird. So, PUCK is being formed by an EB family that has moved to MN to help him out. Lastly, www.the5percentcollective.blogspot.com is up! If you are parents of a child with special needs, or know of one, please go to the site or send your friends or family to the site so we can begin to build a support group that is based on power, optimism, and a desire to be cause in the matter, despite the circumstances.